Discussion in 'Shiny Things' started by Ever Onward, Nov 4, 2018. I was debating to start a thread about old snowmobiles here. I know there is only a handfull of us who enjoy them nowadays. But, since this weekend is put the bikes away for the season, haul sleds out to the front day, I might as well. We have had high mountain snows for 3 weeks till recent. Now Its snowing up high again today. Time to start prepping for sled season opener. Jayrod1318, Shady Pass David, Amphib and 5 others like this. Amphib, mick, locopny and 2 others like this. Thats a great lookin Panther ! 1971 I think. Possibly '72. I had that exact sled a few years back. Goes amazingly nice when tuned. Very lively for a two up sled. Your very lucky to find a original, unmolested in that condition these days. Most of the ones that nice are in the hands of collectors now. Biggest drawback is cracked exhausts and broken / rusted track cleats. Everything else is very simple. Keep us posted on progress. I know a fair amount about them. This is a great post to start. Thanks, I am a snowmachiner who likes to ride bikes, because winters are getting shorter. Than marriage and kids ended my passion for a decade. A couple years ago my father dumped the first new sled I ever bought back on me. After I gave it to him 23 years ago. He took good care of it. I sold it this fall and picked up another new to me sled. Not really vintage, but not new. I enjoyed tinkering on the old machines. Bring on the classics I say. About a '80 Polaris and about a '78 El Tigre. I had a '78 El Tigre in Montana. The 4 plug head free air really had a time trying to stay cool goin up mountain. Only had about 45 mile range to the fuel tank. Really had to watch it close. 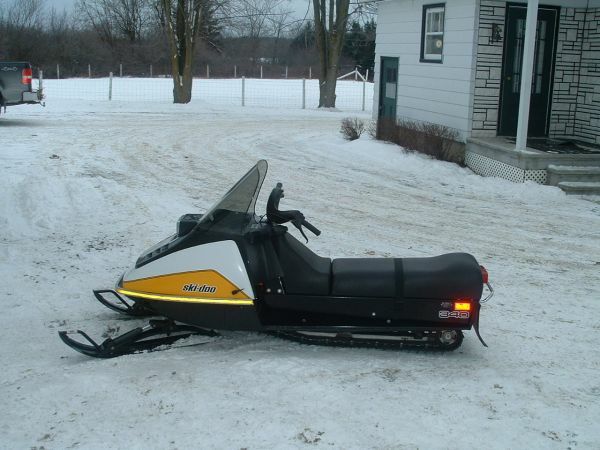 On the other hand I had a 1980 Polaris TXC 340 free air. Ran cooler and could squeeze about 90 miles out of the tank if trail ridden easy. I will try and find old pics if I can. Yes an 80 Centurion. And a 74 or 3 eltigre 400 Quad plug (I owned both years). I lived in Minnesota with the Eltigres, so I could get from gas station to gas station. The Poo I picked up in Colo. early 90s. I put 200 miles on it one day leaving from Buena Vista's Cottonwood pass parking up over the pass, to Tincup and playing in Taylor park. stopped for gas twice in Taylor that day. Good times. Great thread. We used to have a mid-late 60’s Rupp, and an early 70’s Arctic Cat 340. The AC was awesome for one person, very light and quick. Wish I had some pics from back then. I did find a vintage link with some nice Rupps. I’ll have to dig out my vintage photos this winter! No longer into sleds, but I was for about 30 years. I went 108 (radar run) on a first year injected RX-L 650 Polaris, and 81mph backwards on a Starfire 440 triple. Yup, blew the track and spin 180 degrees right past the radar truck. panzer, Ever Onward and xrjak like this. Cant believe that phazer is vintage. Seems like yesterday I bought that thing. I wound up making a polaris 600 killer out of it. Tim bender porting, 38 mikunis, cold air intake, cut the heads....just 10 so i could use pump high test if I had to. clutch springs and weights of course. pipe. Dish liquid/anti freeze injected on the slides...steel picks cause they gave better pen. than carbide, but didnt last to long. Flew in the 1/8th mile. Used to go to the airport and get the 100ll av gas. Looked like windshield fluid......anyway....I have a yam 250 single enticer thats like an '82 or something. Mint covered in the back of my shed. Spam16v and Ever Onward like this. Hows this, me early to mid 70s, what an old turd that was but I loved it. Pocket full of shear pins and a broken hockey stick to flip the bogies back over and away you go,lol, great fun. Shady Pass David, Amphib, Toto and 9 others like this. We had a now vintage Johnson at our lake cottage in the Catskills. This is a net shot in the same colour although I believe out seat was black. I think ours was a 1971. I would tow my father around the lake on his wooden skis. Amphib, mick and Ever Onward like this. used to go to Canada late 60's with my dad and ride my cousins friends mother in laws Alouette. Ontario. By southern algonquin park. My dad had to light up a hibachi and stick it under the engine of our '69 VW microbus to get it to start......ha, cousins ,friends, mother -in -law...sounds like a joke. but true....Anybody even heard of an Alouette? Toto, panzer and Ever Onward like this. My first sled, early 70's was a Skiroule. Seat cover had a Crack so the seat foam would soak water like a sponge then it would freeze so you would ride on a block of ice. Good times. xrjak and Ever Onward like this. Friend raced a 440 Super for a while. The rear engined sled with twin rear tracks Villeneuve raced was so good, they outlawed in in Sno Pro ! Amphib, Crocodile Tears, Phoenix101 and 2 others like this. How about a rear engine Sno Bug ? We got a few in the upper midwest, but pretty rare. I hear most are in Canada. I had a 72 Polaris TX400. I don't think I have any pics but I had a lot of fun on that sled. My dads first was a Massey Ferguson 300 . He was teaching my mom to load it on the trailer . My mom was not scared to give it more gas . The trunk was not big enough to haul it . Toto, xrjak and Ever Onward like this. That last winter I was sledding on 6 inches of powder from my back door. I could see the future was pulling a trailer for two plus hours to get to the powder & I wasn't interested in that. I sold her in February of '87 & bought a mint 1985 Ninja 600, a perfect first motorcycle for a green 20 year old who'd never ridden anything bigger than an RM 80 in the dirt. Thanks for joining in guy's ! I started sleddin around 1973. I have had about 50 or so different vintage sleds. I trail rode at first, then went to drag racing, then on to ice lemans and vintage terrain racing. I have attended hunnerts of vintage shows and events. Im certainly addicted to the simple, and funky older sleds ! Something about their cobbiness and the smell of 2 stroke on a cold winter day really makes me smile. There were nearly 1000 sleds on last years vintage ride at the biggest vintage sled event in the USA. Waconia MN. KLRUSERIOUS? and jimroid like this.